Recipe video above. This is a quick and easy yet amazing way to make "roast chicken" in a slow cooker. It's so moist and juicy inside, it tastes like it’s been brined or marinated. VERY forgiving recipe! Rub – Mix Rub ingredients. should be fairly thick and sludgy. Adjust with extra oil if too thick. Loosen Skin: Use upside spoon to loosen skin of chicken (see video). Spoon most of the Rub under the skin, leaving about 1 tbsp mostly oil for the skin. Use hands or spoon on skin to spread the paste - doesn't need to be perfect. Stuff used lemon inside the chicken. Put rack inside slow cooker (Note 3), place chicken on top. Spread with remaining sludge, sprinkle with a pinch of salt and pepper. Brown skin: Remove chicken from slow cooker, drizzle with a bit of extra oil. Grill/broil on medium high for 5 to 10 minutes to brown the skin (~25cm /10" from heat source). Or oven 240C/450F for 10 min. Pour all slow cooker liquid into a saucepan, add cornflour / water mixture. Mix. Bring to simmer over medium high and cook until liquid thickens to thin syrup (depends how much liquid you have, usually 3 min or so). Adjust salt and pepper to taste, add more lemon if desired (the extra lemon). Pour into jug. 1. Chicken - Remove giblets or anything else inside. If frozen, thaw completely. See below for cook times for different weights. 2. Herbs - can sub with other dried herbs of choice OR use finely chopped fresh but double quantity. Can also stuff a bunch of herbs inside! 3. Alternative to rack - use big sheet foil, scrunch into “rope” then form ring. Or 4 balls of foil. Aim is to elevate chicken out of liquids that it produces while cooking. Pressure cook - Add ½ cup water and pressure cook for 24 minutes on high (depressure naturally 10 min before releasing valve). 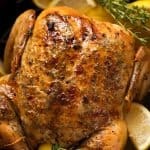 Oven - Follow directions in this juicy Roast Chicken recipe. For almost "all apart" meat, add 1 to 2 hours onto the cook times. Flesh is still juicy! Pressure Cooker: 6 minutes per 500g/1lb of chicken. 5. Prep Ahead / Storage: Prepare chicken with rub under and on skin. Refrigerate up to 48 hours then slow cook per recipe. Cooked chicken keeps for 3 to 4 days in the fridge. 6. Nutrition per serving assumes all sauce is consumed.